Children of the Mountain returns to the moutain that every reader has come to love. Ever since Eva McCall wrote about Lucy Davenport’s arranged marriage to Holman Carpenter, a widower with thirteen children, readers have been eager to know more about the Carpenter family. Together, Lucy and Holman built a new house on the mountain where they raised four more sons. Now, despite having moved away with families of their own, the children still feel bound to Carpenter Mountain. In this sequel to Edge of Heaven, they return home for Holman’s final birthday celebration, then help Lucy cope with widowhood. Jake the peddler reappears with his own offer of solace but with dubious intentions. 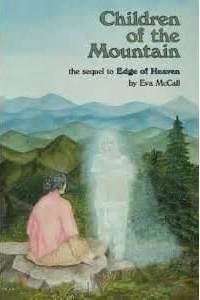 Family conflicts and uncertainty over the future of her home compel Lucy to return to the edge of heaven, seeking wisdom from the spirits of her mother’s people. Ultimately, Lucy must look within to clarify her heart’s desires.